Pricing, product quality, brand reputation. These are just some of the things that can affect your store’s sales performance. However, experience has taught us that lighting plays a huge part in consumer behaviour and has a big influence on whether a product is purchased from your store. Aglo’s Lighting Design Manager, Nari Lee has provided 5 essential steps for lighting design in a retail store, aimed at maximising product engagement. Where are the main products displayed in stores? What is the primary focal point of the store? Your store’s lighting design should aim to create a unique lighting concept that matches your brand identity and products. Your retail store should be aesthetically engaging and emphasise the brand’s character. Don’t be afraid to be unique and don’t waiver from your visionary brand details, but be sure to do this in an efficient and product-focused method. Checking every small detail of your retail store is vital to achieve the optimum outcome for your lighting design. A primary condition to consider is natural lighting. Stores located on the street will benefit most from natural sunlight, particularly if the storefront is facing North. However, relying solely on natural light will lead to difficulties caused by the seasons and the weather. To counteract any negative effects and be adaptable to the conditions, lighting designs need to consider both the interior and exterior of the store. What are my current conditions and realistic goals that can be achieved? Are my favoured lights available before the store is scheduled to be opened? Is there sufficient time to install the lights? If necessary, is there time to re-position the lights before the store opens? Get expert help – All that glitters is not gold. Retail stores and their employees can advise customers, assist them and answer any questions that they may have. This helps to improve the consumer experience. Mondolux prides itself on offering the same service that you would expect from a retail store. We know the lighting industry inside out. We can provide advice that is tailored to your store, find solutions that adapt to your conditions and create designs that showcase your products and brand identity to its fullest potential. 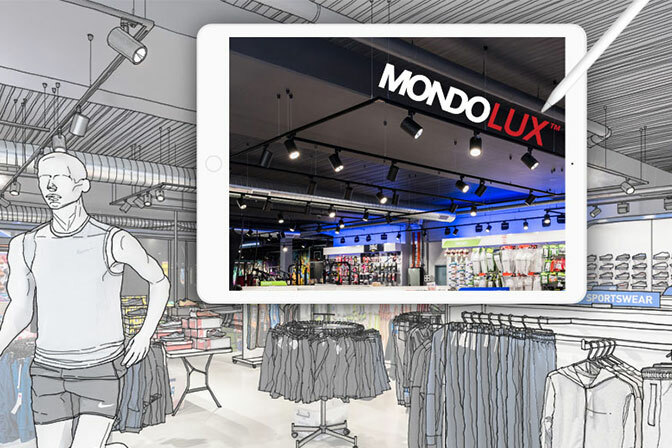 Lighting solutions is Mondolux’s core service, but our client engagement and desire to understand your business sets us apart. Taking time to learn about your brand identity, products and store layout ensures we can create a lighting solution focused on your core service; to make money. To find out more about our products, services or how we can help you find your best lighting solution, talk to us today.